🕊Your best friend passed away. 👵🏻👴🏻You’re taking care of elderly parents. 🍼👶🏻You’ve got a new grand baby. ⏰Look, I know that life is busy and time is short. But guess what? Even if your excuses are legitimate, they won’t to move you closer to your health goals. I’m super proud of my coaching clients because all the things I just listed are currently happening for them. These challenges could be excuses for them. These things are time-consuming, stress inducing life events. In fact as soon as you make a decision to make some healthy changes, you will be all the more cognizant of reasons why you can’t change. Change is difficult, so unconsciously you’ll try to find ways to drift back to the familiar and old habits. This is another reason why it’s helpful to put support in place. I know you have your own situations to deal with. 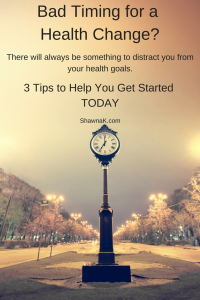 But if you are waiting for the ‘all clear’ or smooth sailing to begin addressing some of your health needs, you will be digging yourself out of a pit of bad habits and poor health. I’m sure you don’t want to wait for a ‘diagnosis’ before making a healthy change. 1. Choose something SMALL to change. You’d be surprised at how SMALL levers move big doors. When a habit is consistently applied over time, you’ll notice big health gains. A change as simple as implementing a consistent sleep pattern/bed time, drinking a specific amount of water daily, adding a veggie with every meal – these SMALL habit changes are easy to remember, they aren’t overwhelming and you can usually maintain them even in the midst of chaos. Often times the scale is the ‘be all end all’ to measure health success. There are SO many other NON SCALE VICTORIES that we can focus on that will buoy us up as we move towards our goals. I encourage my clients to ‘notice what they’re noticing’ in terms of energy, strength, sleep quality, mood stability, how clothes fit, posture, confidence, outlook – there are so many benefits that aren’t measured on the bathroom scale. Let’s look for those wins instead of just weight loss as a measure of success. 3. Get support from friends/family AND a coach. Having someone cheering you on, whether it’s a friend, a spouse, a son or daughter is really helpful but this support isn’t as important as the ‘tough love’ that a coach will provide. A coach will encourage you but will also shine a light on the times when you’re NOT doing as well. Often times in an effort to keep a good relationship, friends and family step back from the hard conversations – it’s these hard conversations that hold your feet to the fire and challenge you out of your comfort zone. So, where ever you are in your health journey, the time is now to do something about it. ✳There will never be a better time. Remember, time and health are nonrefundable – once they are gone, they’re gone. 💫Buy speed, save time, effort and frustrations by putting the support you need in place to finally reach and maintain your health goals. If you need a traveling buddy, I’d love to take the trip on your health journey with you.